KissTies Mens Extra Long Necktie Tall Man Tie + Gift Box (63'' XL) | What Should I Say? KissTies Mens Extra Long Necktie Tall Man Tie + Gift Box (63'' XL) by KissTies at What Should I Say?. MPN: TIE3023. Hurry! Limited time offer. Offer valid only while supplies last. The KissTies extra long/wide tie contains an extra long necktie with a gift box wrap, which is suitable to be gifts for men friends or family member. The KissTies extra long/wide tie contains an extra long necktie with a gift box wrap, which is suitable to be gifts for men friends or family member. KissTies would be for any formal or casual occasion. The texture is smooth and soft, feels like silk. The interlining makes our ties heavy weighted and elastic, which are easily designed for a knot. It comes in a range of designs and colors. It would make a gift and an addition to any man's wardrobe. Including 1 Extra Long Necktie + 1 Gift Box. 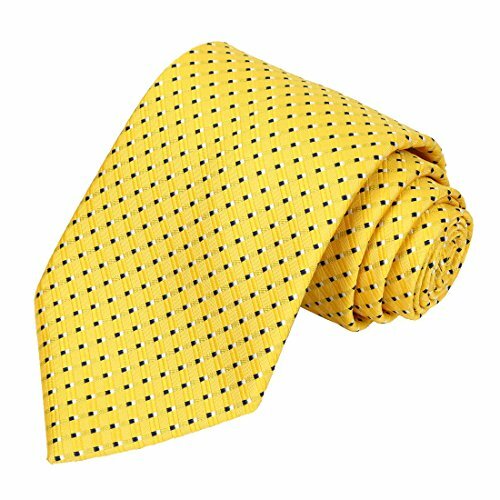 The bright yellow tie allows men to express their style and vary their look without having to buy many different suits. Size: 63'' x 3.9'', The ties are washable by machine soft wash model. Can be steam ironed with low temperature on press cloth. Manufactured by a leading global company, quality all guaranteed. Matching this tie is quite easy. Best are dress shirts in white and blue, and suits in blue, black, gray and tan. If you are looking to combine more patterns to this tie then make sure to choose finer patterns. If you have any questions about this product by KissTies, contact us by completing and submitting the form below. If you are looking for a specif part number, please include it with your message.